The Infant Optics DXR-5 is a lovely little baby monitor with no bells and whistles. However, whilst it does not have a lot of functions, what it does have – it does well and for the price and quality – is well liked by mums and dads. 3 to 4 hour battery life. VOX standby mode to save battery life. >>> No time to spare? To skip my review and check out the best price I can find for the Infant Optics DXR-5 baby monitor, click here. The DXR-5 Infant Optics baby monitor does not have a zoom, pan and tilt facility or a temperature sensor. 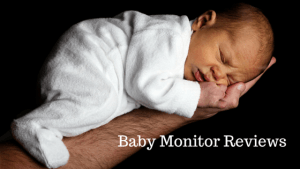 However, the DXR-5 does have two great features – IR night vision, which is a necessity for nighttime monitoring of your baby and a standby mode which saves battery time, if no sound is detected for 3 minutes. You can mount the DXR-5 camera on the wall or stand it on a dresser or unit in the nursery, giving you lots of options for full coverage of the nursery – so this is a good feature. Another great feature of the DXR-5 is that the handheld monitor not only has a rechargeable lithium battery, but it can also be recharged by plugging it into the mains power. On the other hand, the camera needs to be plugged into the mains to operate. You can also add an additional 3 cameras to the DXR-5 system, but you have to manually switch between cameras, whereas with the Infant Optics DXR-8 this facility is automatic (switching between cameras every 12 seconds). With the VOX feature you can switch the video monitor off, which conserves the battery life, and it will automatically switch itself back on when sound is detected. It will also turn itself off if no sound is detected for 3 minutes and automatically turn itself back on when sound is detected. VOX mode helps to extend the basic 3 to 4 hour battery life, so you might find that you only need to recharge the handheld unit once a day. There is also a mute button, which allows you to turn the sound off whilst keeping the LED display screen active on the hand held monitor – the sound automatically turns back on when a sound is detected. The Infant Optics DXR-5 is a closed unit, so you do not need WIFI to operate the system and you cannot access the video recording or monitor your baby using a smart phone or an iPad. Also, it does not have a clip to attach to your clothes (neither does the DXR-8), so you will have to put the monitor in a pocket or next to you on a bench or unit. Keep an eye on your baby when you are busy in another room of your home. Battery: The video monitor is powered by a rechargeable lithium battery which last for 3 to 4 hours, depending on how long the screen is continuously used. Power supply: 110V-240V, will need a power converter for countries outside of the US. Operating systems: This baby monitor does not need a computer for set up or to operation. Infrared: Up to 10 ft in complete darkness. Data encryption: Secure FHSS data encryption. Range: 800 feet in unobstructed conditions, 150 ft in enclosed spaces. Lullabies: No, the infant optics baby monitor does not play lullabies. Warranty: 1 year warranty and 7 day a week support from the manufacturer. Pixels: 320 x 240 auto tuned. Color images: Yes during daylight hours. Batteries: Yes. Lithium Ion rechargeable. Power cords: Yes, the Infant Optics DXR-5 comes with 2 power cords, one for the camera and one for the handheld monitor. Pros: More than 70% of customer reviewers gave the Infant Optics DXR-5 baby monitor a 4 or 5 star rating. Customers liked the clear images from the camera and the energy saving standby mode. Also, they found that the set up is super easy, night vision is excellent and the range is good. We have not been disappointed. Video and audio quality are excellent. There is no interference with other devices in the house. FIVE STARS!! I love this monitor!! I drop the monitor too often and yet it lasted a long time which is impressive cause it is made of plastic. Works right out of the box, very reasonably priced compared to other similar models. Cons: 12% of customer reviews gave the Infant Optics DXR-5 2.4 GHZ monitor a one star rating. The main concerns were that the volume was too low, there were problems with the range and the signals were easily lost. In fairness for the manufacturer, they have said that it is best to move any 2.4Ghz devices, such as internet TVs, routers or smartphones, at least 3 ft away from the monitor as these can interfere with the transmissions. It is nice to see that Infant Optics customer service responds to nearly all negative reviews on Amazon – offering help and solutions. Australia Shipping: The DXR-5 Infant Optics monitor is not shipped to Australia – see my Shipping Guide forother shipping options that really work well. The DXR-8 has more functionality than the more basic DXR-5 with pan and tilt, zoom, a temperature sensor and 2-way communication. If you only want a budget model, then the DXR-5 is a sturdy little baby monitor, although the extra features of the DXR-8 are very seductive. Also, remember that if you want to add more cameras to the system, you can’t mix DXR-5 and DXR-8 cameras on the same system. If you want a nice little baby monitor with no bells and whistles, that works well and is very affordable, then the Infant Optics DXR-5 might be the one for you. This is a basic model, but it has everything you will most probably need at a budget price. If you want more features then you can step up to the DXR-8 model which has additional features.